Happy Birthday Mewtwo! | The Arcade Archives! Continuing with our celebration of Pokémon’s 20th Anniversary we want to wish one of the most popular legendary Pokémon in any generation a Happy Birthday. So Happy Birthday to Mewtwo! But you maybe wondering how we know that today is Mewtwo’s Birthday? 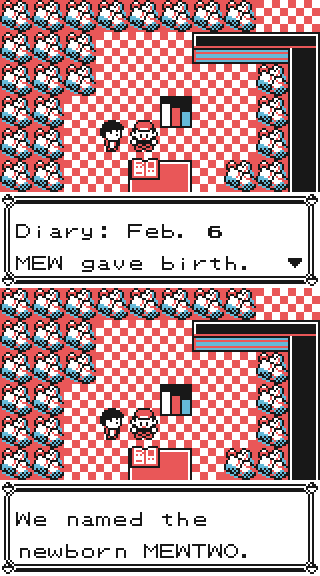 Well, according to a journal entry in found in the Pokémon Mansion in the original Pokémon games: Pokémon Red and Blue (here in the states) Mew gave birth to Mewtwo on February 6th (as seen below). This is after a lot of genetic experiments done to that Mew by Scientist, presumably part of the evil organization Team Rocket. Interestingly enough one of those Scientist is speculated to be Mr. Fuji (picture in the Pokémon Origins movie below), a kindly old man that you help in Lavender Town earlier on in the game who helps orphaned Pokémon. For more interesting info on Mewtwo don’t forget to come back here to thearcadearchives.com on February 27th (the official Pokémon Day) for our special two part Pokémon 20th Anniversary special. This episode is featuring a look at Pokémon The First Movie: Mewtwo Strikes Back. Don’t forget that you can help us Celebrate the 20th Anniversary of Pokémon too! Just send us a recording of yourself answering the questions below. If you send it to talesfromthegamegrid@gmail.com by February 15th you could have your recording on our podcast. This entry was posted in Archive Entries and tagged #Pikachu, Ash Ketchum, Birthday, Mewtwo, nintendo, Pokémon, Pokeball, Pokemon Anime, Pokemon Omega Ruby Alpha Sapphire, Pokemon20 by ubernerd527. Bookmark the permalink. Great article, I thoroughly enjoyed it. Pokemon Red & Blue were my first and my favourite generation of the pokemon series. Thank you so much! Yeah Red and Blue were my first games as well! Now that’s the way to play it!